Vice President Joe Biden showed up at the University of California San Francisco’s Genentech Hall this morning for a round table discussion with those in the tech industry about efforts towards a future without cancer. Biden’s 46-year-old son Beau passed away from the disease last Spring and President Obama announced Biden would be in charge of a $1 billion national cancer moonshot initiative during the President’s last State of the Union address in January. 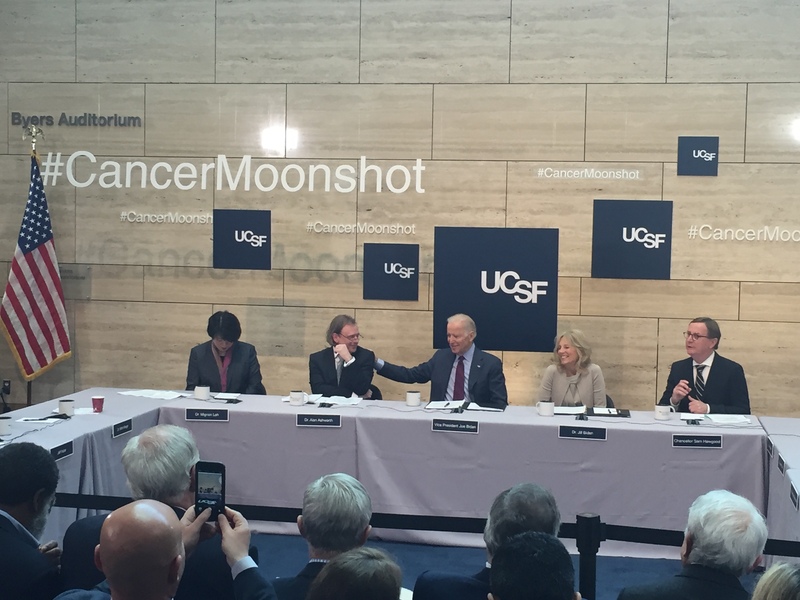 “It stuns me, the incredible worldwide response to #CancerMoonshot,” Biden told the crowd of press and medical professionals in attendance today at UCSF. The veep has been on tour since the announcement, discussing the initiative in several cities throughout the U.S. – he stopped by the Huntsman Cancer Institute in Utah yesterday – but his visit to Silicon Valley is what could really help push his efforts to eradicate the disease in the long-run. The Bay Area teems with innovation and a culture encouraging different approaches. Several Silicon Valley VC firms have also already funded and helped launched startups tackling the disease. Atomwise, Ixchel, and Notable Labs all came out of Y Combinator to progressively speed up the pace towards a possible cure. CRISPR – a relatively new technology enabling scientists to snip out parts of genetic code and slip in other genes, is a Berkeley discovery that could help those with a genetic predisposition toward the disease. The Vice President highlighted genetic treatments, engineering, precision medicine, big data research and other interesting endeavors in the fight against cancer during his speech. According to the VP, this is the first time in his professional career where the people advising him know far more than he does. “I’m reaching out to those who may be able to help,” he said.